I haven't been doing much these past few days other than feverishly trying to finish a recent commission. Coming in at around 30 marines, 5 terminators, a Librarian, a Land Raider Redeemer and 2 Rhinos, it's a sizeable project. Right now, I'm two and a half days into it and I'm a little over half done. Once I get the whole thing finished, I'll be sure to post more pics but I wanted to pass along a few things I've learned in the short time I've been working on this particular project. 1. Keep your color scheme simple. You can't go wrong this way. The second part of this would be to work out all the kinks and little details before sitting down to paint your whole army. You don't want to change anything mid-stride. 2. Spray priming. Find the good stuff and use it. Huge time saver here. 3. Base coat with opaque paints, highlight and shade with transparent ones. I'll go into this more in the future but opaque paints (ones that cover completely in one coat) are great time savers. 4. Assembly line painting works... if you stick with it. Sure, just painting the metal parts on 30 Marines can be hard to do but it's worth it in the end. 5. Once again, the GW washes are great for adding depth and shading. They are worth picking up and learning how to use if you haven't done so already. They are another time saver. I used 5 of them on the model above. 6. Set aside time to paint/convert/build,etc. No mater what the amount, dedicate that time to the task at hand and nothing else. Don't let distractions keep you from working. Once you get started, seeing your progress will keep you motivated to keep going. Some good tips, especially the last one. I think back and if I only managed a half a mini a day in painting, I'd have a lot more finished minis! Right on! The new foundation paints and washes are amazing. I still use the GW inks for some things, but only to keep new models uniform with ones already painted. Motivation is key and you have to do a little every day. I have to agree with 3 and 5. I just worked up a test mini for my new Guard using mostly foundation paints and washes - it was quick, easy, and looks pretty good. Great advice, Ron! I wish I was disciplined enough to dedicate time...often the effort to pull out the paints and set up is enough to stop me! I have to get better about that! #5 is important, my wife won't bother me when I have my "little man" time. Of course it helps that I'm making a little money sometimes. As for #3, I plan on expanding on that one in the future. I'm going to go through the process, step by step. Very good tips, sir! #5 is the hardest to stick to - but the best of the lot. Listening to very long books while painting is a great joy and makes me look forward to painting. I enjoy painting for painting's sake, but I also like reading (or now, listening) to books. A combination of the two is bliss. I have a CD I listen to that is exactly 45 minutes long. That's how I keep track of time. Sounds like a pretty big project! Thanks for sharing the tips, some great stuff there mate, I personally follow number 6 strictly - without aims, dedication and directions, my plans almost always go wrong. Time is key! Very nicely painted Ron! 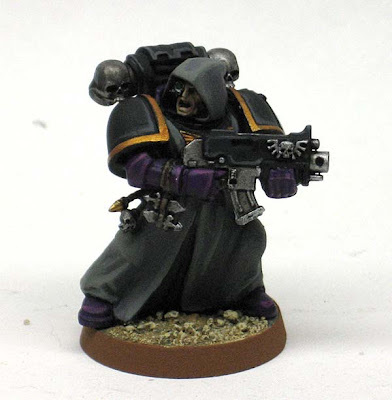 The gold on the shoulder pads provides a great accent to the overall colour scheme. Personally, I tend to be a one-by-one painter ... it has its advantages and disadvantages, but its what I enjoy!